Happy weekend everyone. How about starting your morning with simple yet healthy breakfast? Have you ever heard of this phrase" Breakfast is like a king, Lunch like a prince and Dine like a pauper". I love this statement and no matter how busy is our life, don't even let breakfast fall low in your list. Taking a few minute to enjoy your breakfast can make a difference to your day. Muesli is a ready to eat cereal and muesli contains high fiber that needed by our body. And Muesli is must healthier compare to cereal and is whole grains. Organic Walnuts and Cranberry with Grain Flakes contain organic dried fruits such as cranberry, raisins and etc. What I love about Organic Walnuts and Cranberry with Grain Flakes as it does no have artificial colouring/ Flavoring, Zero trans fat, No artificial sweetness and No high-fructose corn syrup. 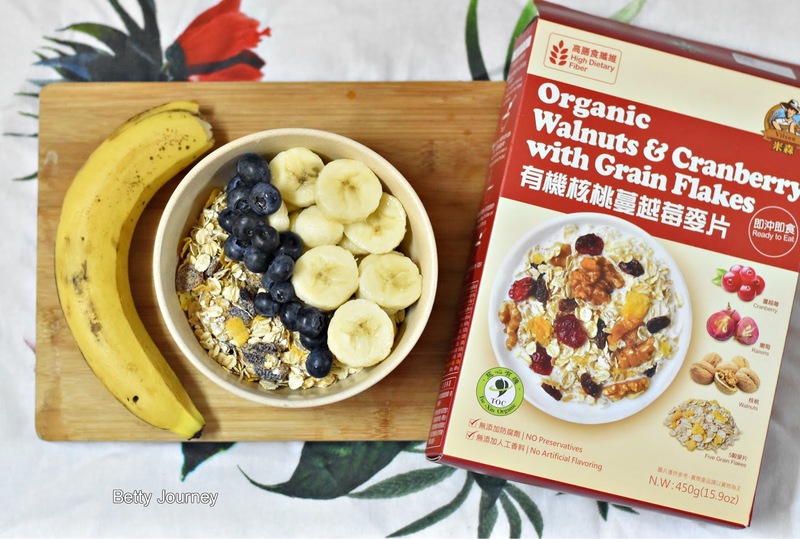 And the cereals is EU organic certification. Muesli is a bit dry if you consume it directly. Add in some fresh fruits to add in some flavor. Or add in some milk. Dark Choc Cranberry & Roasted Nut Crunchy Cluster is a type of granola. Granola is breakfast food and snack food that consist of rolled oats, nuts and honey or other sweeteners such as brown sugar. And granola high in fiber, whole grain and it provides beneficial fats. The size of granola is a bit bigger compare to Muesli and cereal. 100% natural ingredients and not coloring or flavoring.